The Silver Pin of Excellence was introduced in 2001 to encourage a high standard of ritual in the Province. Details can be read on the Provincial website here. On 8 May 2015, WBro Lloyd Foster (pictured) had the pleasure of Elevating Bro John Sandiford into the Royal Ark Mariner Lodge. It was not reported before the meeting that WBro Lloyd was attempting to perform a Ceremony of Excellence. On his first attempt, WBro Lloyd was successful and was awarded the Silver Pin of Excellence, having delivered a ceremony of the highest quality! Deciding to carry on with the hard work, WBro Lloyd began the difficult process of preparing to deliver a Ceremony of Excellence in the Mark Degree. His first attempt was unsuccessful. This is not a surprise. Silver pins are not given away lightly and success is far from guaranteed. 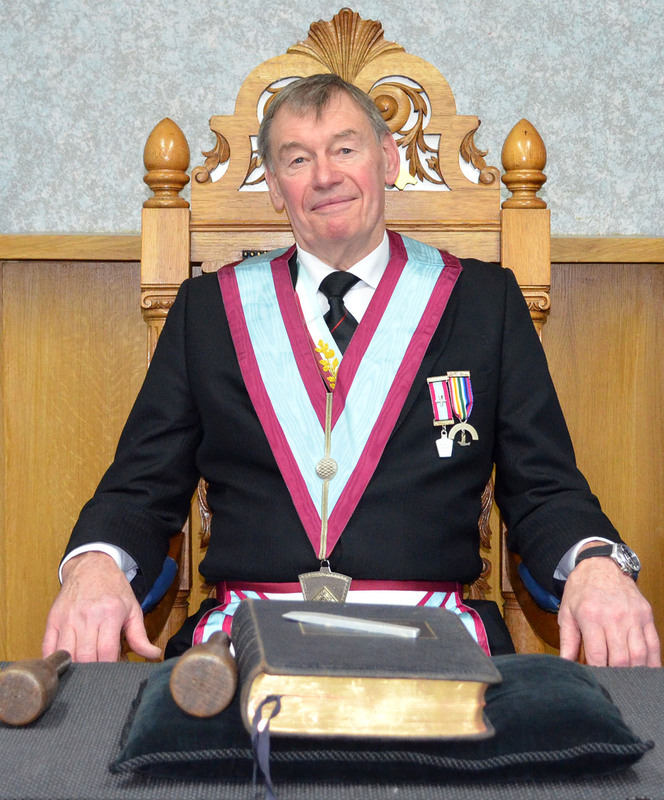 Undeterred, WBro Lloyd prepared to develop on his hard work and make a further attempt. On 13 December 2016, WBro Lloyd Advanced Bro Tony Kilkenny in an excellent ceremony, which earned him the Mark Silver Pin of Excellence. This means that WBro Lloyd is only the sixth member of the Province to become a double pin holder, a tremendous achievement! The Lodge now, in fact, has 7 Silver Pin holders, three of whom hold the Double Pin. The Lodge is very proud of WBro Lloyd's achievement and offers him sincere congratulations. WBro Lloyd wishes to thank everyone, who helped him prepare for his pin ceremonies, not least his dog Simba, who had to endure many hours of listening to the repetition of ritual. Simba can be seen recovering from a particularly gruelling rehearsal of the Ceremony of Advancement. Many thanks to Mrs Indy Foster for supplying the picture.